Yesterday I uploaded a paper to the Arxiv (Spectral functions in metallic AdS/CFT) which should be online Monday. (Edit, up now 0904.3905). This morning I've had my normal Saturday routine of Chinese and Spanish vocabulary, combining Anki for long term memory retention and Genius (great program, terrible name - really hard to Google for!) for the short term. Both of these work on spaced repetition techniques, though Genius is based on intervals of flashcards (with this I can effectively memorise around 100 Spanish words in an hour, though this will only stay fresh for less than 24 hours) whilst Anki is based on intervals of time (and is very effective for building long term memory). Together I find 10 minutes a day plus an hour on a Saturday and Sunday is very good for increasing my vocabulary with little effort. Anyway, feeling reasonably happy to relax for the afternoon I thought I'd write up one of the major stories of my travels in Morocco. Perhaps the most exciting episode in the week I was away. I should at this point introduce the members of the party for ease of description. The five of us who had come out from Santiago in some sort of unison were Paolo, An Italian, our elected driver, independent and an experienced traveler, Merlinda, German, a seasoned traveler in South America, Daniel, a Peruvian masters student in Santiago, and Yolanda, the only native Spaniard on our trip, and completely fearless. We had organised a trip into the desert around 10 hours drive South East of Marrakech, a journey we had made over a period of two days, stopping off at some incredible sites on the way. 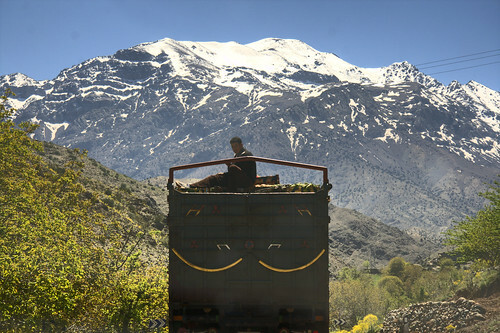 As you head towards the desert from Marakkech, you are immediately met with the sight of the High Atlas Mountains, a stunning vision as you leave the chaos of the city behind you. You spend some time winding your way around tight turns and shear drops, before coming out the other side several hours later as the landscape changes gradually from the gently undulating foothills of the mountains to the plains of the desert. We organised the desert trip as we got into one of the last major towns before the roads turns to dust. Having done little planning we simply wandered in the baking heat from agency to agency trying to find out how much we were likely to be ripped off by and what was the best deal for the short time we had available. In our experience, Moroccans are extremely welcoming but uncannily laid-back. Organisation is spontaneous, and the 'no worries, it'll be fine' attitude is prevalent but actually seems to work. We eventually organised our trip with an agency who bought us a couple of big bag of provisions and told us to drive 100 km to the very last town on the map where we would meet a guy called Ahmed in a bar who would take us into the desert. The hour drive was smooth, but punctuated by our concerns that we would get there to find no sign of an Ahmed, or perhaps too many Ahmeds. Eventually we arrived at the asigned bar and asked for Ahmed, who of course was not around. There was however a group of four young guys who said not to worry. They would take us out, they knew Ahmed and it was all organised. We just had to give them our bags and they would take them to the camels up the road, out of sight. This was all done with such uncanny nonchelance that we felt pretty uneasy. Who were these guys? Were we about to have all our things taken and left in the desert for the mangy dogs to pick over. As we tried to acertain the verity of these guy's claims a big four-wheel drive turned up and a tall gentleman came out, looking serious and in charge, dressed in the normal desert attire of a long white robe and head-scarf. Ahmed certainly looked like he was boss and knew what was going on, so we followed him, with the four guys, who it turned out were indeed with him, to the camels sat resting around the corner. Ahmed took our things in his 4WD and raced off through the desert to put our bags there for when we arrived. In the meantime we were introduced to our transport, mounted the camels and headed off into the desert sunset, led by two brothers, who chatted quietly in Berber as we started out first camel trek. During the hour or so on the camels we were led in a small circle a few kilometers across the gently rolling dunes and out to the camp which was to be our home for the night. As we rocked back and forth, enjoying the evening warmth, the sight of the sun setting was obscured by an incoming dark cloud. We were told that the sand was coming in, and the winds began to pick it up around us and deposit it in between our teeth as we chatted quietly along the way. By the time we arrived at the camp the winds had died down but the ominous cloud remained in the direction of the sunset, moving, it seemed, in our direction. Somehow we all decided to split at this point and once we'd been made to feel at home in the camp and introduced to the basic facilities I headed off a hundred yards or so into the desert. At this point the winds had completely vanished, and as I lay down on the sand the warmth of it from below matching my body temperature perfectly and the lack of wind meaning absolute, complete silence, the sensory deprevation felt wonderful. I don't think I've ever been somewhere so silent and I the meditative state stayed with me for the ten minutes or so I lay there without moving a muscle. After ten minutes the silence ended with a few gentle gusts of wind, blowing the sand around me into my ears and over my body on the ground. I got up, dusted myself off and headed back to the camp, the winds continuing to grow steadily. By this point the ominous cloud which had been clear before was no longer at a distance, but was surrounding us in its outer layers. I went to the tent 30 yards from the main shelters where the toilet was located. By this point the dusk combined with the sand in the air meant that I could only make out the tent from the lights on the outside, and the candle from inside gave minimal illumination. As I emerged from the bathroom I was met with chaos. In the two minutes inside, the winds had picked up from a gentle breeze to a howling gale, the air was thick with sand, and the noise was incredible. Standing in the doorway I could just make out the lights of the main tents, but as soon as I stepped out I couldn't open my eyes, the sand getting in however narrowly I tried to open them. My ears quickly filled with sand and the rough feeling of wind scraping across my exposed skin was a harsh wakeup from the sensory deprivation ten minutes earlier. I gently edged forwards as the wind continued to howl and for a brief second I tried to work out how serious this situation was. Up ahead I could simply hear the shouts of the guys in the camp, the strange words getting more alien as they reached me through the wall of sand. Moving forward, opening my eyes for a fraction of a second every few steps I eventually reached the main camp where the guys were rushing around trying to get everything inside. We all made it into the main tent, the Berbers scraping the dust out of their eyes, which had been open the whole time, needing, as they did, to make sure everyone was safe. 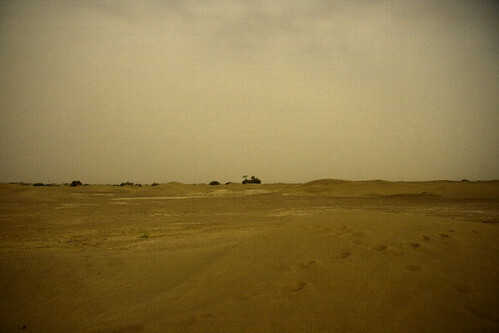 We realised at this point that Paolo was still out in the desert and one of the guys went out to look for him. The seriousness of the situation clearly depended on how long this was going to last and it was hard to tell from their expressions what the real situation was. Ten minutes later as the wind died down just as fast as it had picked up, a sandy Paolo strolled in from the desert, having spent the sandstorm sitting on a dune, enjoying the assault, without a care in the world. He looked confused but content and we all went inside, happy to have experienced a rather exciting phenomenon, but relieved that it looked like things were calming down. Indeed the wind died down and stayed gentle for the rest of the night, the sky never quite clearing and completely obscuring the stars. Ironically, the main reason I'd wanted to go to the desert was to see the stars in a location hundreds of kilometers from nearest city. Clear as it was that this was not going to happen, I resigned myself to simply enjoying the night in the desert. We relaxed as the evening progressed, our tagine being cooked up for a late dinner and music being played afterwards. To me at least this didn't feel put on. The guys simply sat around the fire singing and playing guitar letting us come and go as we wanted, and thankfully it felt like they were playing for their own enjoyment rather than our entertainment. As we sat around I chatted with an English woman, who was the only other non-local in the camp and the girlfriend of one of the guys who worked there. She told me of a bus leaving the town from which we had started the camel ride which was to leave at 6am the next morning. It had been my plan to get out early the next day and move off on my own to wherever I could. She was going to be taking the bus too, to head up North to renew her visa in the Spanish enclave on the coast. I spoke with the guys at the camp and they said they could organise a bus ticket for me too and that I could be taken to the bus stop the next morning. I was happy at having experienced the desert, if only for a short time, and the idea of spending the morning in a rapidly warming camp didn't particularly appeal. Certainly with more time to spare it would have been great to spend a few days there but given the constraints I decided to take the bus to Marrakech the next morning. I was told I'd be woken at five to have some breakfast and then be taken to the bus stop. Getting into the sleeping tent at around two in the morning having spent a lovely evening sitting around listening to the music and chatting I tried, in vain, to get any sleep. At four thirty I heard shouting from outside my tent as Ahmed opened the flap and told me to get up. A little startled I rubbed my eyes, got dressed and got my things together, heading towards the main tent for a spot to eat. There I found Ahmed glaring at me over croissants and honey, sitting on the floor looking dour. He invited me to sit with him and have something to eat. I sat down next to him and the stink of alcohol hit me, the empty bottle of red wine rolling under the table. My heart rate picked up as I tried to assess the situation. He was clearly not happy but this was a situation I was going to have to deal with. We spoke in broken French and English as he explained that we both understood each other. He pointed at me mumbling something about Israel and winked, I couldn't work out what he meant, whether this was supposed to be a sign of some understanding or a threat. Still trying to work out exaclty what he was trying to imply he said that he was a good man and that because he was getting up so early for me I could perhaps give him a little money, perhaps five euros. This had not been in the deal when we had chatted the previous night, but I figured that if this was going to stabilise the situation then five euros was ok. I said that I had to go out for minute as Paolo walked in and sat next to Ahmed. Paolo and Yolanda had said they wanted to come to the town with me, as they had the keys to the car where some of my belongings were. They were not happy to give the key to Ahmed to bring back later, probably a wise decision. As I came back, Paolo walked out looking concerned, saying that Ahmed was very unhappy and wanted more from me. I smiled and said it was fine, I would pay five euros and the situation would be smoothed over. I sat down and Ahmed repeated his demand, so I got out five euros and gave it to him. He looked at it, and then at me with pure disgust, taking the note and throwing it on the ground. 'No!' he said 'five-ty euros, five-ty! What is this?' He suddenly wanted fifty euros to take me two kilometers to the bus stop, as time was quickly running out and my chance of getting to my destination was fast disappearing. I explained that this simply wasn't possible, but that I understood his sacrifice at having to get up early (though it was clear that he hadn't gone to bed). I said that I needed to get the bus, and that we both had to be reasonable. One thing I discovered on this trip on a couple of occasions was that I can continue to speak in a relaxed tone which appears to calm people down, even when I'm feeling panicked inside. I wouldn't want to test this too often but the times that I needed it on this trip, things seemed to work ok. Indeed on this occasion too, with a bit of persuasion, my heart beating quickly, he agreed that he would take me without the fifty euros and we headed for the car, Paolo and Yolanda in tow. Getting in the car, he threw his empty glass out of the window, snarled, and turned on the engine. It was a considered decision taking this short trip with him, though I would never condone getting in a car with a drunk driver. It was five in the morning and we were going to be driving through the desert for a couple of kilometers and then a hundred yards into a small village which was filled with a few local bars and a few houses. Clearly there are strong arguments for why I shouldn't have done this but at the time I didn't feel that I had much of a choice and my guess was that the risk to those in the car was small, while from what I had seen earlier, the likelihood of anyone being around at that time in the village was smaller. Luckily I was right and nobody was on the streets at this time, bar a single man at the busstop. It also seemed somewhat obvious that he spent a lot of his time driving around in this state. He put his foot down and the back wheels span as the 4WD took off across the dunes, me, holding on tightly and preparing for a collision with a dune at an unlucky angle. We raced along, the back of the car sliding as we took the corners of the path marked out through the desert. I continued to talk with him in as calm a manner as I could, hoping it would pacify him a little, but he continued to snarl and bark at Paolo and me. As the car hopped over the last dunes, at full pelt, we entered the village and raced around the first two corners, quickly reaching the bus stop where a lone man stood. He slowed down and pointed to it, saying that the bus must have gone and that we would have to race to catch up with it. This was clearly rubbish and my heart sank as I imagined racing around the winding mountain roads with a drunk maniac at the wheel. Thankfully I remembered that I had to get my things from the car first, and that the car was parked next to the bus stop. We stopped and I got out, took my things and went hurriedly to the man at the bus stop who told me that he was taking the same bus to Marrakech which was dune to arrive shortly. I smiled, relieved that we'd made it in one piece and that I wasn't going to have to get back in the car with this crazy guy. He came over to me, still ranting and demanded money again. He was still angry with Paolo and given that I was soon going to be out of there but that Paolo and Yolanda would still have to deal with him I considered that it might make things easier for them. I gave him five euros, feeling bad at giving money to someone so completely irresponsible, but hoping that this might make less trouble for my friends. The bus pulled up, I got on and breathed a sigh of relief. The English woman got on with her boyfriend, having run all the way from desert camp as they discovered their motorbike had a flat. Ahmed was still outside firey eyed as I watched Paolo and Yolanda run around the corner to escape him. We pulled away and I ran through the last hour's events as the day brightened and I considered what was ahead for me. 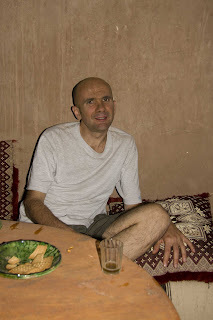 I still didn't know where I was going to spend the night as I wanted to go further North than Marrakech. In the end I sat on the bus for almost 11 hours before going to Marrakech train station and randomly picking up a ticket for Rabat, another five hours North, finally arriving, exhausted but happy, in time for a late dinner. In the mean time things back at camp continued in a surreal fashion. Ahmed arrived back at the camp at around 9, having gone hunting for Paolo and Yolanda with no luck and demanding that Merlinda and Daniel come with him to search for the crazy Italian. Unsurprisingly Merlinda and Daniel were none too happy with these demands, having planned to take the camels back to the town, as agreed the night before. The long and the short of it is that he drove them into the town, ranting all the time, threatening Paolo. At this point Merlinda cleverly turned on her perfectly calm, ditzy tourist disguise and asked if she could take a photo of the beautiful buildings. She and Daniel got out and as soon as his back was turned they made a run for it. Managing to lose him, they found their way to the only possibly place that they figured they might find Paolo and Yolanda, the bar which we had first expected to find Ahmed. Paolo and Yolanda were sat inside, looking perfectly relaxed and sipping on mint teas. Finding that Ahmed was now in town and furious they grabbed there bags and sprinted for the car, hoping not to be seen in the process. They made it to the car which they had hidden around a corner, and raced off, with no sign of the 4WD in the rear-view mirror. It took them a while to be sure that they were alone, but a half hour or so out of town they could relax and try and put together the pieces of what had happened in the last few surreal hours. Speaking later it turns out that their understanding of the situation differed markedly from the truth that I discovered talking with the British woman who said that this crazy guy brought nothing but trouble to the camp with which he only had vague connections. Anyway, we all made it out, thankfully, unharmed and only a little shaken. Personally I was happy at having gone through the minor adventure, finding that such things only add to the strength of memories of a good holiday...perhaps that says a little too much about what makes me tick, but there we go. "Holographic Spectral Functions in Metallic AdS/CFT" (arXiv:0904.3905) is now up on hep-th, in case you hadn't seen it yet. Was this a city-localised lost or something more widespread? Somehow, I think only through chance, I managed to get around in Tokyo ok, and thankfully never got on the wrong Shinkansen - the perfect way to get to where you don't want to go, extremely fast! Oh, it was definitely more widespread. I spent a week at Super-Kamiokande several years ago (professor to students: "Would anyone like to spend eight days in Japan, all expenses paid by the National Science Foundation?" Me: "Me me me me me!"). Midway through, I had a day off, and the fellow I was working for suggested doing a bit of sightseeing. The village nearest Super-K is a picturesque little spot called Mozumi, next to which runs a little local rail branch. The local rail connects to the main network at Inotani, where you can get on a train going to Takayama in one direction or Toyama in the other. My supervisor suggested spending the afteroon in Takayama, "One of the many cities in Japan which calls itself 'Little Kyoto'". Later, in the Toyama station. . . .
Fortunately, I had yen to spare, so I got myself on a train from Toyama to Takayama, wandered a bit through the 'Little Kyoto' quarter and had a relaxing good time. After picking up a few inconsequential souvenirs, I returned to the Takayama station and got on a train. . . which was not going to Inotani. I turned myself around again at a stop whose name I don't remember, returned to Takayama, got myself pointed to Inotani and took what might have been the last local train of the day back to Mozumi. It was all for the best, though, as on my way back I had to catch a plane from Toyama to Tokyo, so at least I knew how to get to Toyama! I think that Japan trip set my record for being a clueless bumbler, stochastically exploring the available options. I mean, I still am a clueless bumbler, intrinsically speaking, but I take precautions now to cover for it. In my view that's definitely the best way to get to know a new place. I now only take a map if it's in order to meet someone else. Otherwise I just figure I'll get there in the end and somehow it all seems to work out. It felt like real freedom to get up in the morning in Morocco and not have any idea which city I would be in by dinner. The lack of any pressure was fantastic. Indeed in Japan where the price of the trains are pretty high, that's not the sort of mistake you can be making too often, but it all adds to life's rich pattern.